Hello lovelies, it’s Miss Lady Lace here and today I have for you the next fabulous edition of my Monthly Vintage Attire series. This is a regular feature where I share the vintage fun and vintage outfits from the previous month. This blog is a little delayed as I focused on getting my wet set series blog up as soon as possible. I’m filming in my living room today after my husband and I rearranged it on the weekend. We’ve still got a bit of work to do, but it’s so much more aesthetically pleasing. Once we’ve completed the changes and renovations to this area I’ll be making a house tour video! In today’s video I’m chatting about some of the fabulous things that took place in the month of February, I adore putting this blog together as it gives me time to reflect on the month I’ve had. Pinup Society Magazine launch it’s first issue this month, with issue one now being on sale.Submissions are now open for issue two, with the deadline for this being April 30th, so be sure to submit your photos and articles. I’ve of course been enjoying my weekly visits to Cherrybomb Beauty Parlour, where they take care of my hair and beauty needs. They’re glamorous vintage salon in Lathlain and are your one stop shop for all your vintage hair needs. I forgot to include so much in this video, but that’s alright. I do hope you enjoyed it anyway. If you did please do give it a like and comment, as that really helps me. Follow me on social media to keep up to date with my daily pinup fun, and to never miss out on one of my videos be sure to hit the subscribe button below and I’ll be seeing you very soon! 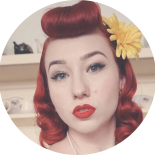 This entry was posted on March 22, 2019 by Miss Lady Lace in Monthly Vintage Attire, Videos, YouTube and tagged 1940's, 1950's, blogger, glamour, miss lady lace, miss lady laces pinup blog, perth, perth pinup, perth pinup blog, perth pinup community, pin up, pinup, pinup blog, pinup blogger, pinup fashion, pinup girl, pinup life, pinup lifestyle, pinup perth, red lips, retro blog, retro girl, retro glamour, the perth pinup community, victory rolls, vintage, vintage blog, vintage blogger, vintage fashion, vintage girl, vintage glamour, vintage perth, vintage pinup blog.